Active hikers and trekkers know that having the best survival axe can give you a great advantage in the woods. Axes come in handy in a variety of backpacking and camping situations. They have a wide range of uses. They can be utilized for splitting firewood, shaping tent poles and for hunting. Axes are often compared with knives and machetes. It has, however, been proven that a survival axe is more convenient to bring into the backcountry as compared to a survival knife. Modern axes remain virtually unchanged from the primitive axes. An axe is generally composed of two main parts: the head and the handle. These parts however can be further broken down for clarity. Head – this is the part of the axe that bites into the wood. Good quality axe blades are made from a combination of low-carbon steel and high-carbon steel. The head is mostly made of low carbon steel for more flexibility, then high carbon steel is inserted as the cutting edge. The two steels are then welded together. Poll: the opposite end of the bit. Serves as a balancer for the axe, to prevent wobbling during use. Cheek: This is the area past the bit. Eye: the hole where the handle is inserted in. Axes are also categorized according to the number of blades they have and the length of their hafts. Single headed axes are axes that have only one bit. They have hardened poles and wedges made of hard wood. The blunt side of the axe can be used as a hammer in case on is immediately needed. The double bladed axe has two blades, thus it is multifunctional. Double headed axes often have one head as a felling axe and the other head as a splitting axe. Handle– also known as the haft, the handle can be made from several materials. Traditionally it is made from a wood called hickory, but, nowadays there are existing handles that are made of metal and fiberglass. The handle of an axe is designed to direct the force of your chop on the axe head, thus the material it is made of should be a good shock absorber. Wood is a great material for the handle, since it’s sturdy, lightweight and easily replaceable. However, it is not very durable. If the handle is made of wood, one must inspect the grain of the handle. The axe handle must have a grain that runs parallel to the bit of the axe; otherwise the handle will easily break off. Fiberglass is lightweight and is sturdier than wood but it is prone to chemical damage and the haft is difficult to replace when broken. Metal is also used because of its durability; however, it is not ideal for long treks because it is relatively heavy. Axe handles can be curved or straight. A curved handle has a more natural feel when it is gripped and swung. Curved handles can be used for single-bladed axes. Double-bladed axes require the use of straight handles to accommodate usage of both blades. Cutting, splitting, felling and shaping wood are the main functions of an axe. Axes are designed to meet a certain purpose. There are many types of axes categorized according to the shape of their head and their purpose. The Felling Axe. This axe is also known as the cutting axe. Defined by its tapered head and thin shape, the felling axe can be hefted sideways and cut quickly through trees and wood. This axe typically weighs between 3 lbs. to 4 lbs. and is 32 inches long. It is very flexible and the thin blade can cut deeply into the wood. The felling axe can cut across the grain of a log and is ideally used for cutting logs and tough barks. The Splitting Axe. This axe is heavy as compared to the felling axe. The head of this axe is wider and its blade cannot cut through grain. This axe is heavy and broad and is not recommended for beginners. The shape of the axe prevents it from getting stuck in a wood. This axe splits the grain of the wood to break them apart. As the name suggest, it is ideally used to split wood usually for fire. The Shaping Axe. While the blade of felling axes and splitting axes have pronounced curves that aid in penetration of the wood, a shaping axe has a flat blade. The performance of this axe is limited. It is great for applying finishing touches or for evening out rough surfaces. Axes must be used for their intended purposes. Otherwise, a lot of time and energy would be wasted on a particular task. Using a felling axe as a splitting axe would take a lot of time and vice versa. The possibility of the axe breaking and the handle going lose is also increased when axes are not used properly. The smallest axe is known as the pocket size axe. This axe measures 12 inches long and weighs only around 1 pound. It is a strong sturdy axe, very convenient to carry. The tomahawk or the hatchet is slightly bigger than the pocket size axe at 18 inches and 1.5 lbs. The hatchet is a favorite of campers because of its portability and versatility. It is used for cutting firewood and for making emergency shelters. The limbing axe is a medium sized axe at 24 inches and 2 lbs. It is used for cutting branches off trees. The felling axe is a full sized axe measuring 32 inches and weighing 3 lbs. It can be used to cut down trees or limbs. Oftentimes it is double – bladed, making it very versatile. The maul is the biggest and heaviest axe; it is around 40 inches long and weighs 7 lbs. It is used for splitting. The splitting maul looks like a sledgehammer equipped with a pointed axe head. Due to its weight, one must be very careful when handling the maul. There are many characteristics to consider when looking for an axe. There are different types to choose from, each of them is designed for a specific purpose. A pocket sized axe is ideal for chopping firewood during camping or trekking. It is easy to shop for pocket-sized axes or for hatchets because size would not be a consideration. In the case of mauls and felling axe, the size should fit your body size. To test whether the axe fits your body size, hold it by the head and see if the end of the handle fits comfortably into your armpits. If it is longer, you would not be able to handle the axe. Weight is another factor to consider when purchasing an axe, particularly the weight of the head. The weight of the head is directly proportional to the amount of the work it will do. The heavier the weight of the head, the lesser is the tendency of the head breaking. However, survivalist prefers axes with the greatest balance between weight and performance. Alignment and Balance. The axe’s head and haft should be aligned perfectly; otherwise it would not perform very well. Balance the axe on your palm by carefully placing its head between your thumb and forefinger. Safety is a top priority when looking for an axe. The axe heads should be covered in sheaths. The attachment of the head and the handle must not be loose. Some axes are manufactured as “full tang” or “single construction”. This means that the head and the handle are made up of the same material and are forged together. Below are examples of survival axes, hatchets and tomahawks available. The selection intends to help you choose a survival axe that would best fit your needs. Why purchase this axe: The Unlimited Wares MT – 629 Tomahawk Compact Full Tang Camping Axe is one of the finest quality survival axes being sold. Coming at only 8.5 inches and 6 oz, it is portable, lightweight and comes with a comfortable paracord grip. The axe is made of full tang, thus making it very sturdy and durable. The blade is made of very sharp stainless steel, promising to delve into whatever it comes across. This is great for a novice axe thrower or for occasional backpackers. Why purchase this axe: The SOG Base Camp Axe is a mid-weight, mid-sized axe designed with durability in mind. It has a sharp bit forged from 1055C steel. Its full tang construction allows for sturdiness. The axe is coupled with a nice thermal moulded rubber that ensures a firm grip even in slippery situations. This axe has been designed to be simple yet elegant. The head was formed to reduce friction during use and the poll, or the area opposite of the bit, can be used as an emergency hammer. The SOG Base Camp Axe is ideal for cutting. It is a great axe to bring during a vehicle supported camping trip but it is quite heavy for long hiking. Why purchase this axe: The Columbia River Knife and Tool are known for their premier line of tools. All their tools are built with the most advanced equipment and incorporated with innovative designs. The Columbia River Kangee T- Hawk is a tactical tomahawk. The head is composed of a sharp SK 5 carbon steel blade on one end and an aggressive spike on the other end. The Kangee is not welded rather it is made from a single slab of high carbon steel for a more solid frame. The geometry of the blade is made for efficient splitting, chopping, shaving and for over all toughness. The T- Hawk has a curved handle for a more comfortable hold of the tool. It also has a finger grip coil for enhanced control. All these make up a well balanced, lightweight, portable tool. Why purchase this axe: The Black Legion Hatchet is a 13.5” hatchet built with a nice solid feel. The 4” head is made of stainless steel; it is composed of a sharp blade and a blunt edge that could double as a hammer. The handle is made of composites, specifically that of fiberglass. The handle is also rubberized, thus ensuring a slip-free grip. Its small size and light weight makes it an ideal tool to bring on a camping trip. Why purchase this axe: The MTech USA Camping Axe is a reasonably priced, sharp axe. With an overall length of only 11 inches, this axe is compact and very portable; the ideal axe for active trekkers. 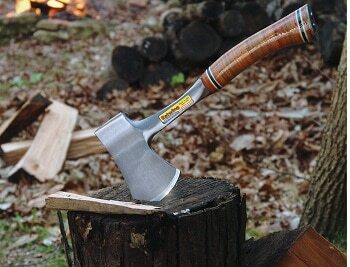 The head and handle is a single piece steel construction giving the axe a more robust feel. Its 3 – inch 440 stainless steel blade can cut through almost any type of wood. The handle is made of durable rubber for a more comfortable grip. Why purchase this axe: The Estwing axes are world famous and favoured by outdoorsmen from all over the globe. The Estwing Sportsman’s Axe is one of the most widely available hatchets. The 14- inch, 1.5 – lb axe is made of American steel and is forged in one piece thereby deleting the possibility of the head and the handle falling apart. The cutting edge is 3 ¼ inches long, tempered for a sharper cut. Its attractive leather ring grip that been sanded and lacquered for a sleek and beautiful finish. Why purchase this axe: There has been a long standing debate on what should be brought to the backcountry, a knife or an axe. The Gerber Gator Combo Axe has put an end to that debate by allowing a survivalist to bring both! The almost 9- inch hatchet has a head made of forged steel for superior retention and a handle made of glass- filled nylon which makes it almost unbreakable. Inside the nylon handle lies a hollow magnetic area that holds a knife. The handle is covered with Gator textured rubber for comfort and improved control. This convenient tool is ideal for chopping kindling for fires and for chopping thick vegetation. It is not recommended for use on thick logs and trees. What Is The Right Axe for You? As with any other tool, price becomes a factor in the selection of an axe. When factoring in the amount of money you would like to invest in an axe, think about how often you would use the axe and for what purpose? Cheaper axes have good quality handles and heads, too. 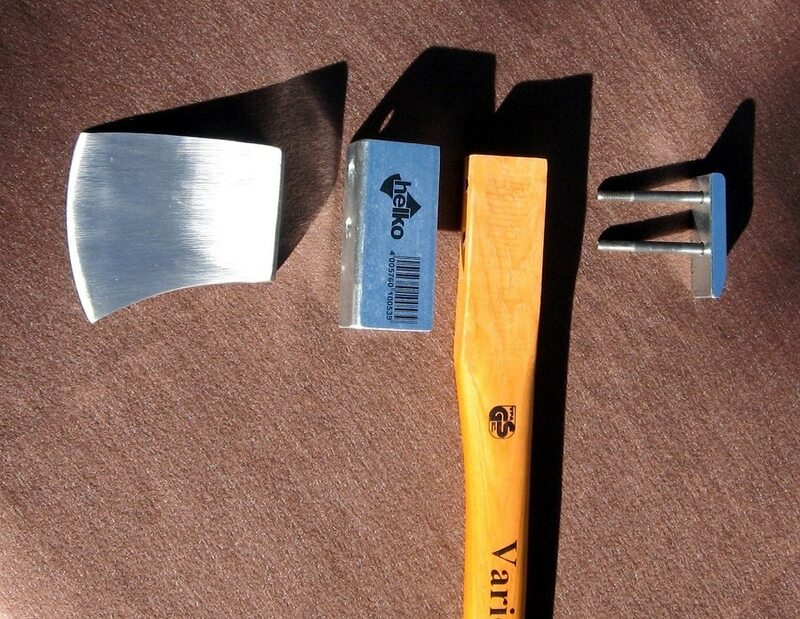 With proper usage and maintenance, these less costly axes can also go a long way. Choose an axe based on its purpose. This way, the axe will be more efficient and less prone to damage. Other than the purpose of the axe, do not forget to weigh in important specifications such as head alignment, balance, weight of the head and the size. If purchasing from a store, ask to hold the axe for closer inspection and to get the feel of it. If buying online, read online reviews from trusted websites. Always compare prices and measure the pros and cons of your selected axes, this way you will be sure to purchase an axe that fits your budget and your needs. Ultimately, personal preference and purpose will be your guides to choosing your choice of survival axe. An axe is a simple tool, but owning one brings a lot of advantages especially for survivalists and campers. Although it is quite simple, a number of factors must still be considered when one is planning to purchase an axe. If you take time to find the right axe that would fit your needs, you will be equipped with a tool that you could use for a lifetime.